VideoStudio Ultimate 2018 takes its aware-winning platform and adds Split Screen video, elegant tilting tools, and new quick-edit controls Tap into 2000+ fun and sophisticated effects, play with speed, edit 360 videos, and tell your story multiple angles! 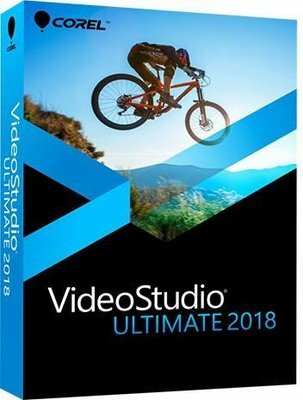 For your best movies, and the best value, VideoStudio Ultimate is the only choice. Stunning Videos - Edit HD, 4K, or 360 video with precision on the multi-track timeline. Unlimited Creativity - Express yourself with 2,000+ customizable filters and effects, including premium effects from industry leaders. Intuitive Workflow - From templates to timeline editing, develop your skills and create impressive videos. Learn as you edit! Award Winning - Choose a video editor that’s known for being feature-rich and easy to use. Support for Virtually all Popular Formats - Dive in and start editing, and enjoy support for a wide variety of cameras and formats. Create elegant titles and introduce and tell your story with style. Add fun effects, choose from templates or create your own custom 3D motion titles. Control textures, lighting, motion, and more to create that dramatic cinematic opening you want to see. Create a stunning title in seconds by applying one of more than 100 animated templates. Customize text, colors, and more for a result beyond what you thought possible. Add titles, bottom third titles and more to help narrate your story. Tap into hundreds of pro-quality presets and creative effects--delivering results beyond what you thought possible, leaving you more time to focus on what matters, telling your story. Help fix one of the most common problems when capturing video. Remove the shake and stablise video from handheld cameras for a cleaner, smoother end result with proDAD Mercalli. Show multiple videos simultaneously with pre-designed split screen templates, or create your own custom layouts with Split Screen template creator. Captivate your audience with new titling possibilities. Start with presets or create your custom motion, control, lighting, textures, and more in 3D Title Editor. Apply effects to selected areas of your video. Use brush and shape tools to define and fine-tune a masked area and add selective colour, blurring, and more. Add incredible creative effects and correct almost any video problem with these popular apps from proven industry leaders. Get hundreds of dollars' worth of professional-quality special effects applications for only a few dollars more than the price of VideoStudio Pro. Creater a stunning title in seconds by applying one of more than 100 animated templates, customise text, colours, and more for a result beyond what you thought it possible. Enjoy over 400 amazing overlay effects to add to your videos for transitions and more. You’ll find something for any occasion with proDAD Adorage video effect packs. Broadcast-quality titles and graphics let you easily make sophisticated title animations, such as type on text, text on a path, and randomization. Remove the distortion of fisheye effect captured by widw angle or action cameras. Start with presets for GoPro cameras and then fine-tune adjustments with correction tools. Crop and resize your media directly in the preview window. Make quick edits, creat picture in pictures, or straighten your media in a few easy clicks.